As much as I love to travel, this nagging feeling tends to creep up about one week before we leave. It’s that pre-travel stress starting to set in, and it usually stems mostly from having to leave the dogs (can’t we just bring them everywhere?! ), and also from feeling like there’s just no way we’ll get our to-do list checked off before we leave. Between the packing, planning itineraries, arranging dog sitters, last-minute shopping, wrapping up work projects, and making sure the house is clean and buttoned up - it always leaves me feeling like it might just be easier to stay home. The thing is, I know once we get through it all and pull out of the driveway, I’ll be so glad we’re on our way. Up until about six months ago, our departures were pretty much chaos. The dogs start to stress the second our luggage comes out of the hall closet, and let’s just say their panting and pacing while we pack isn’t the most relaxing thing in the world. Then of course there was the last minute vacuuming and dusting we would try to do (gotta make sure the place is clean for the dog sitter! ), and the 15 trips back and forth from the car into the house (Forgot my jacket! Did you grab the charger? Did we turn off the lights?). Not the best way to start our adventure. Plan for departure at least one week ahead | Any little things we can start doing well in advance, we do them. I like to start a running list of things not to forget when packing, and typically start making a pile of clothes and accessories that I want to bring about a week ahead of time (I wrote a bit more about packing tips here). Then there’s the not so fun stuff: arranging for mail / newspaper hold, lining up a dog sitter (more on on that below! ), coordinating snow removal or lawn care while you’re away, and prepping the house for your departure (and return!). These are easy things to get done in advance (this coming from a former procrastinator), and the days leading up to your trip will be much calmer if they’re taken care of. We used to run around like crazy trying to pick up and clean the house right before we left, but have since learned our lesson and do a deep clean the week before, and then just be sure to keep it up during the week. Hide it from the dogs | This sounds absolutely ridiculous and really only pertains to those that have dogs who do the travel guilt trip like ours do, but I’ve found that packing on the sly has decreased our travel prep stress so much. If it’s out of sight, it’s out of mind for those sweet pups, and so we “pack” our clothes into piles on the dresser and only pop things into our (hidden) bags when they’re in another room. On the day we leave, one of us will take both dogs for a walk while the other does the back and forth, bringing our luggage from the house to the car. The dogs are SO much calmer when we do leave (since we tricked them into thinking we’re just heading out for the day like usual! ), and we’re so much happier when we jump in the car. Win-win! 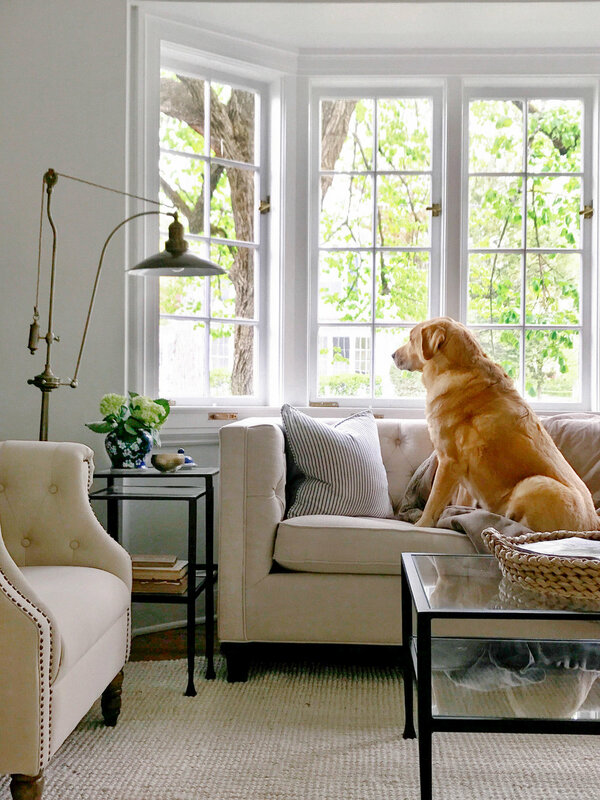 Add security cameras for peace of mind | There’s just something about being able to check in on the house (and dogs!) while we’re away that puts my mind at ease. Being able to actually see with my own eyes that everything is as it should be is priceless. We got these security cameras from Blink a couple years ago, and have loved using them to check in on things while we’re gone. We ended up going with these cameras over other brands since they don’t need to be plugged in (they come with batteries and we haven’t had to change them yet! ), and you can mount or place them anywhere you like. It also helped that they’re super affordable! We love the motion detection alerts (which you can switch on and off as needed), and also love being able to just check in with live video on our iPhone to see the dogs happily snoozing (on my pillow no less!) or to see if a package has been delivered on the front porch from the outdoor camera. We’re up to four cameras now, and if Tom has his way we’ll probably have 10 by the end of the year ;) Love that you can purchase an add-on unit anytime! Prep the house for our return | Returning from an amazing vacation is hard enough, so we do our best to leave the house ready for us to jump right back into the routine when we come home. Things like making the beds with fresh sheets, buying some snacks to stock the cupboards (what’s worse than coming home to no food?!) and just generally making sure that it doesn’t look like a tornado swept through our house all make it so much easier to relax when we get home. Would love to hear your tips for lowering stress before you travel! A big thank you to Blink for sponsoring this post. We’ve used (and loved!) our own Blink cameras for over two years now, so when Blink reached out about collaborating this spring, it was an easy yes - I’m thrilled to share them with you!